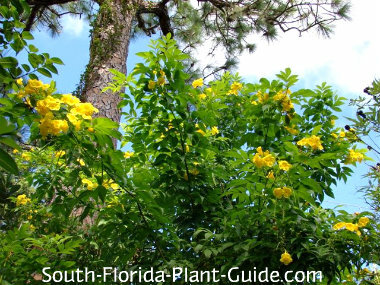 Like a bush allamanda on steroids, yellow elder is a big, beautiful, fast-growing shrub that produces bright yellow trumpet-shaped flowers. 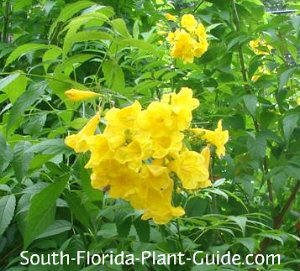 Sometimes called Yellow Bells, Esperanza or Yellow Trumpetbush, it flowers on and off all year, more in warmer weather. 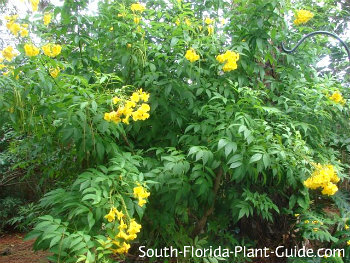 The golden blossoms - which are said to attract butterflies and hummingbirds - contrast against the plant's bright green, wide-spreading foliage to create a very showy plant. This is not a shrub for a small space. But it can soften a formal landscape, and works well with an eclectic landscaping style to show off its color and size. As an accent for Mediterranean or Spanish-style architecture, this shrub is perfection.....and it looks right at home in a woodland setting, too. Yellow elder can grow very wide with long droopy branches. 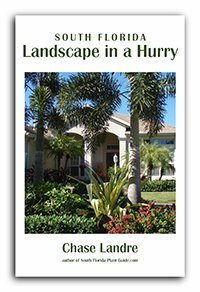 Plan to leave plenty of room on each side of the shrub so it doesn't get in the way of foot traffic or overtake other plants. It''s sometimes available as a single-trunk standard (tree-form) - or you can prune the shrub to become a multi-trunk tree. This plant grows pretty quickly and therefore the stems aren't as strong as slower growers, so place it in a location protected from strong winds. There is a smaller variety called Gold Star Esperanza that is semi-deciduous and more cold tolerant than the larger yellow elder. The dwarf variety can be kept about 3 or 4 feet. These shrubs are fast, vigorous growers that can get large - 12 to 20 feet tall - but they can be kept about 6 to 8 feet tall and wide. They are best growing in the warmth of Zone 10. They're evergreen though winter can cause some defoliation. This plant will grow in full sun to part shade. It blossoms in any light but you'll get more flowers with more sunshine. Add cow manure to the hole when you plant. Make sure the planting area affords good drainage. 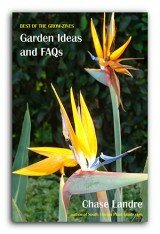 If your plant is placed correctly, trimming isn't necessary other than a hard pruning in spring (late March or early April) for overall size. If the width of the plant flows out where you don't want it, trim those branches as needed. You can cut off the seed pods that appear after flowering to promote more blossoms. Yellow elder is moderately drought tolerant once established, doing best with a regular irrigation schedule that allows enough time for the plant to dry out between waterings. At the very least, give it a good, long drink during dry spells. Fertilize 3 times a year - in spring, summer, and autumn - with a good granular fertilizer. You can supplement feedings with applications of bone meal and/or liquid to encourage heavier bloom. Place these plants 4 to 6 feet apart. They grow very wide, so allow enough space (at least 4 feet) so that nearby smaller plants won't be overwhelmed by this large shrub. If you're planting along a walk or drive, come in 5 or 6 feet. Come out from the house 3 or 4 feet. This plant will grow well in a large container. 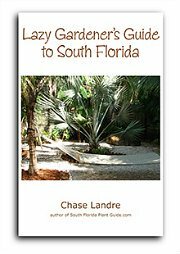 COMPANION PLANT SUGGESTIONS: firebush, hibiscus, plumbago, ixora, nandina, jatropha, and gold mound.